Marissa Mayer was crystal clear on speaking about her motives for buying out Tumblr – advertising, advertising, advertising. Be it a long time coming, or Mayer’s influence, Tumblr is prepping to on-load a lot more advertising. Tumblr is reportedly starting to test in-stream ads according to the company’s ad sales pitch deck leaked to Business Insider after the acquisition announcement. Tumblr is courting beta launch partners and offering prime real estate on both its user’s dashboard and Tumblr’s Radar for a pretty penny – $200,000, to ballpark the figure. What this means is that these “native” ads – ads that look like any other user-generated post – will show up on the news feed-like page called the dashboard that shows you what your friends and the people you’re following are publishing. It’s a move that Tumblr has avoided for the most part, instead relegating ads to areas off to the side called the “Radar” and “Spotlight.” But those ads are easy to ignore. Tumblr has made no secret of its attempts to monetize its platform. For a company with $125 million in funding on an $800 million valuation, it raked in a paltry $13 million in revenue by the end of 2012. As we all know now, however, Tumblr found a buyer. 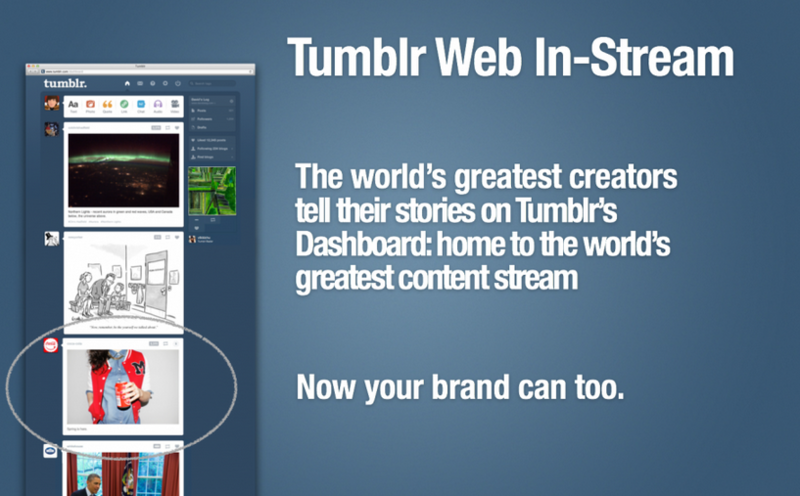 With Yahoo’s hands on the hip network, you can’t be surprised that the company intends on packing Tumblr with ads. In fact, not only will the new in-stream ads be rolled out but Mayer has plans to work with bloggers to put up ads on their site as well. Tumblr has more than 300 million monthly unique visitors, although that figure is debatable since the pitch deck notes 225 million monthly unique. 24 billion minutes are spent on the site per month, with 120,000 new signups daily. These are stats that advertisers have reportedly been salivating over and eager to promote their content for a hefty price. So what is it that these beta testing advertisers would be getting for $200,000? The leaked ad sales pitch deck says that advertisers would get 10 desktop Radar posts between May 21 and June 21 and each post stays up there for a full 24 hours. And of course at the same time, these beta advertisers will be the first to test out the in-stream posts for 21 days between June 1 and June 21. These ads aren’t targeted, by the way. Tumblr has committed itself to keeping itself devoid of banner ads at the expense of rather minimal ad revenue generated from its existing ad products, unlike social networks like Facebook. But regardless, promising not to screw it up, Yahoo is confident that Tumblr will turn a profit by 2014.